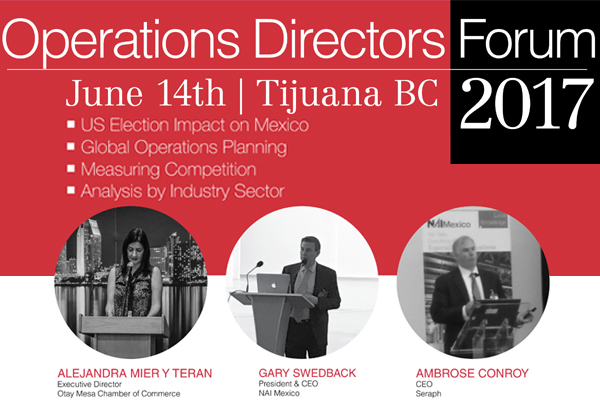 NAI Mexico is pleased to invite you to the Tijuana Operations Directors Forum, Wednesday, June 14th. Global industrial operations executives in Northern Mexico are meeting for lunch at Club de Empresarios de Baja California , Tijuana, from 1:00 – 3:00 p.m. The event will feature 3 industry experts— providing thought leadership from ​the Otay Mesa Chamber of Commerce (Cali-Baja unique global location), Seraph (management consulting), and NAI (global business advisory) discussing the US political election, Mexico operations competitiveness, potential tariff impacts, and how executives can remain competitive during 2017’s disrupted market uncertainty. The luncheon event is complementary to NAI invited clients . Tools to help operations remain competitive with their internal corporate operations in the US— and world markets. What Are Most Important Issues to Maintain Competitiveness for Management Teams in Northern Mexico? Club de Empresarios de Baja California, Manuel Marquez de Leon 1301 Torre Diamante, Piso 26 New City Zona Urbana Rio 22010, Tijuana, B.C., Mexico.